L: 25.5" x W: 27.5" x H: 39.5"
Torino Leather Accent Chair This Torino leather accent chair in brown and cappuccino is a stunning tribute to Italian design. Wrapped in luxurious bicast leather, it’s a beautiful blend of traditional style with its hand carvings, fluted legs and elegant nailhead accents. This Torino leather accent chair in brown and cappuccino is a stunning tribute to Italian design. Wrapped in luxurious bicast leather, it’s a beautiful blend of traditional style with its hand carvings, fluted legs and elegant nailhead accents. This is one of the most comfortable and beautiful chairs I have owned. It's not only extremely functional but also is truly a piece of art in any room. The chair looks great!..It is comfortable. It goes perfectly in a small space. It matches like it belonged with the leather recliner and sofa recliner we purchased last week. It fit like it was part of the set. I feel it should be displayed along side the Cole Collection. The rivits match perfectly.The color is perfect. We bought 19 of these chairs for our business. They stand up beautifully and look beautiful in our business! rooms and very comfortable! I picked up this chair at my local R&F. The service at the store was excellent. The loading dock attendant carried it to my car. When I arrived home and opened the package I found that the leather back of the chair had a small scuff mark. There was no damage to the outside box so suspect that the chair was packed in this condition. The scuff is only noticable when under a bright light. That and the fact that I would have to repack and return it to the store made me decide to overlook it. The chair is very sturdy and was easy to assemble. 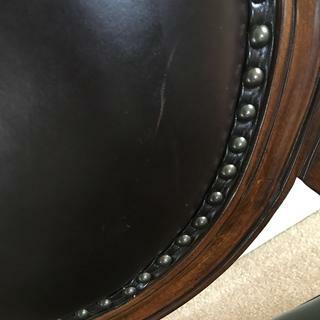 Scratch on front of leather back. IF I ever buy anything else from you, I will do a full unpack at the loading dock and do a very careful inspection. I am unhappy with this purchase. I purchased this chair for the entry area, but it also serves as extra seating when needed. It is very comfortable and has a substantial, but not heavy 'feel.' Great looking. Quality leather chair that is beautiful and classic. Beautiful elegant leather chair that is very comfortable to sit on to relax. Love it I now have 2. What I like the most is how comfortable and well made it is. A good buy. The two chairs I bought fit perfect in my living room. It is made well and very comfortable to sit on. Classy looking accent chairs that really dress up our sitting area. Fair price and prompt delivery. Perfect addition to the family room! This chair is just beutiful, it matches the loveset we have, same browm color. What I like about this chair is it caracter, elegant yet clasic, it don't take a lot of space, and is very confortable. It may look a little fragile but is a strong solid wood chair, so happy thave it. I love the look the chair adds to my living room. It is also a comfortable chair to sit in. Purchased this chair for entry area and as an extra chair for use when guests outnumber capacity in living room. It's a good-looking chair that is comfortable and solid. Adding to that, it is a great value. Elegant and classy is what I can say about this chair and also comfortable. We love it. Funny story. We love shopping in the Dickson City, Pa store.We are fixing our new house, so when they delivered our chair I told them to put it downstairs in our house.Well I like it so much in the room i have to go back to the store and buy another chair to put upstairs in our house. We have purchased a few pieces of furniture from this store and worked with a gentleman named Dave who is very helpful. Thanks. We purchased this chair last minute before thanksgiving to replace a worn chair. We picked it up at our local store because we needed it right away. It was sooo easy to put together and is absolutely a great purchase. It is beautiful and very comfortable. I highly recommend this chair. A very stylish accent chair that is really rich looking which adds class to any area. I purchased this chair for my bedroom to replace a different style chair I had and it is absolutely beautiful! It matches my bedroom set I purchased somewhere else nearly two years ago perfectly and was the exact finishing touch I needed. Anyone would think they were purchased together. I picked the chair up at the store and had to assemble it, which was very easy to do. The instructions were very clear and the hardware was actually organized and not just thrown all together in a bag. Love everything about the chair except for two defects in the leather. Will notify Raymour and Flanigan today. Hoping for a satisfactory resolution . Hello Lois, we're sorry this has occurred! If you would please send your order details, contact information and a copy of your concerns to rfcare@raymourflanigan.com we'd love to see how we can help. BEST ANSWER: Approximately 250 lbs. Does this chair come assembled for in store pick up? BEST ANSWER: Typically, the chairs will come mostly assembled. Sometimes, the legs will need to be attached. Hi what accent chair goes with bartolo sofa? BEST ANSWER: There is a matching Bartolo chair, but if you prefer an accent, we have many options available. The Bartolo comes in both Gray and Cafe, so your choice of accent chair may depend on the color of the sofa that you are choosing. We would be glad to make some recommendations if you would like to contact us at 866-383-4484 option 3. Would this be useable as an end dining chair (table has 25” clearance)? BEST ANSWER: The Torino Leather Accent Chair can be used as dining armchair. The arms for the Torino have a height of 25" as well. do you have a small table to complement this chair, like the one in the picture witht he spiral legs, or similar? I have seen this chair in your Lin Ctr store in black leather. What is that style # and do your other stores carry it? BEST ANSWER: We only stock the Torino Leather Chair in the brown shown online. What you saw in the store may have been a special order. If that is the case you will need to reach out to your local showroom for further special order details as special ordering is exclusive to showrooms only. BEST ANSWER: Bicast leather is has a polyurethane coating on the top. It is then embossed with a leather pattern for a more consistent texture. Bicast leather tends to be easy to maintain due to the coating, and it does not stretch or breathe. What is the hight of the seat? BEST ANSWER: The seat height is 39.5 inches. what is the seat hight of the chair? My mom bought this chair about 5 years ago. Unfortunately it got a small tear on the seat. Is it possible to get replacement parts? BEST ANSWER: You would just need to contact our Customer Care Center. A representative there can assist you with this. They can be reached at 1-866-383-4484, option 2.